ST. PETERSBURG, Florida -- Minor League Baseball today announced the Class A Advanced Carolina League will add two teams for the 2017 season as part of a broader realignment at that level of play. The California League's Bakersfield Blaze and High Desert Mavericks will cease operations at the completion of the 2016 season. The 2017 season will see a return of professional baseball to Kinston, North Carolina. Kinston served as the home of Carolina League clubs from 1956-57, 1962-74 and 1978-2011. Several locations are under consideration for the second Carolina League club, with Fayetteville, North Carolina having made steady progress toward a stadium that would see play beginning with the 2019 season. Fayetteville served as the home of a Carolina League club from 1950-56, and as the home of a South Atlantic League club from 1987-2000. "This step was taken with the best interests of Minor League Baseball, both leagues and our Major League Baseball partners in mind," said Minor League Baseball President & CEO Pat O'Conner. "California League President Charlie Blaney, Carolina League President John Hopkins and the club owners in both leagues worked to address this important issue and I thank them for their efforts. We are happy that professional baseball will return to Kinston and we are pleased with the steps Fayetteville has taken to bring professional baseball back to that great city as well." 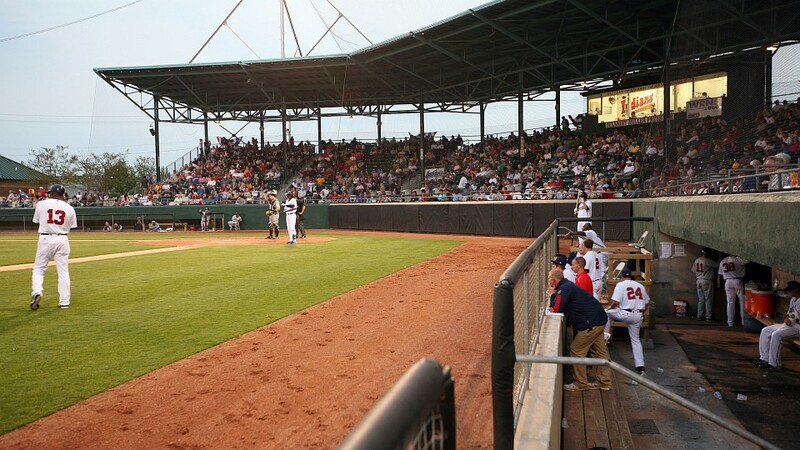 The Kinston club will be owned by the Texas Rangers, who have a 12-year agreement with the city of Kinston to provide a team to play at historic Grainger Stadium. The city of Fayetteville recently approved a memorandum of understanding, a key step toward a new downtown ballpark. The affiliate and ownership of that club will be announced at a later date, and the club would play in a temporary location until the ballpark is completed. "The Texas Rangers are very happy to be bringing baseball back to the great city of Kinston and we want to thank Minor League Baseball and the Kinston leadership for helping us to make this a reality for 2017," said Texas Rangers Ownership Committee Chairman Neil Leibman. "We are excited about creating the best fan experience possible at Grainger Stadium, and we look forward to working with the city of Kinston and its residents to make it a top Carolina League franchise." "Realignment doesn't happen often, and we are excited to be a part of this process that addresses some issues important to our industry," said Carolina League President John Hopkins. "It's flattering that clubs are making a major commitment to become part of our league, enabling us to return Carolina League baseball to two outstanding communities where we have some memorable history." "As a league we worked diligently to explore alternatives to realignment, but the lack of alternatives combined with importance of this project to address broader issues within Minor League Baseball led us to help facilitate this realignment," added California League President Charlie Blaney. "It is with great regret and reluctance that the Mavericks are one of two teams being contracted from the California League, as the Mavericks would prefer to remain in Adelanto as members of the California League," said High Desert owner Dave Heller. "The uncertainty of the future, stemming directly from the City of Adelanto's effort to lock us out of a ballpark for which we have a binding legal contract, creates too much uncertainty for next season and beyond. That uncertainty is simply unacceptable to the team, the other members of the California League, the Texas Rangers and Minor League Baseball. As a result, this unfortunate action had to be taken." "Baseball has had a long and wonderful history in Bakersfield," said Bakersfield owner D.G. Elmore. "I am sorry to see it come to a close."